addressing your individual health needs. Treat disease, prevent illness and promote wellness. IV and injection therapies are very effective methods not only to treat disease, but also to prevent illness and promote wellness. Consuming oral supplements does not always provide the best results since we have to rely on perfect digestion and absorption in the intestine, which is often not the case. Secondly, it is often impossible to consume that much of a nutrient at one given time. We can bypass the intestines using injection techniques by directly introducing nutrients into the bloodstream. By achieving high concentrations of nutrients in the blood, it can then be delivered directly to our cells. Our IV’s and injections are made up of vitamins, minerals, electrolytes, amino acids, antioxidants and other nutrients, in specific combinations depending on the in individual needs of our clients. Intravenous (IV) and injection therapies are therapies that introduce nutrients directly into the body. By introduction substances directing into the body, we bypass the need to swallow, digest and absorb these nutrients. This increases the availability of these nutrients to the body and therefore has a more rapid and direct effect on the body, with 100% absorption. Intravenous therapies makes use of an IV administration set, including the carrier solution, and a needle securely place into a vein. Nutrients are either pushed, or dripped into the vein over a period of time. An IV ‘drip’ uses an IV bag, known as a carrier, which is usually sterile water or saline. The nutrients are put into the carrier solution and the bag is hung on an IV pole, and given slowly over a period of time ranging from 20 to 75 minutes. A common example of an IV drip is the use of electrolytes on patients suffering from dehydration. An intravenous ‘push’ makes use of a syringe filled with specific nutrients, and those nutrients are pushed directly into the vein by the doctor or nurse. 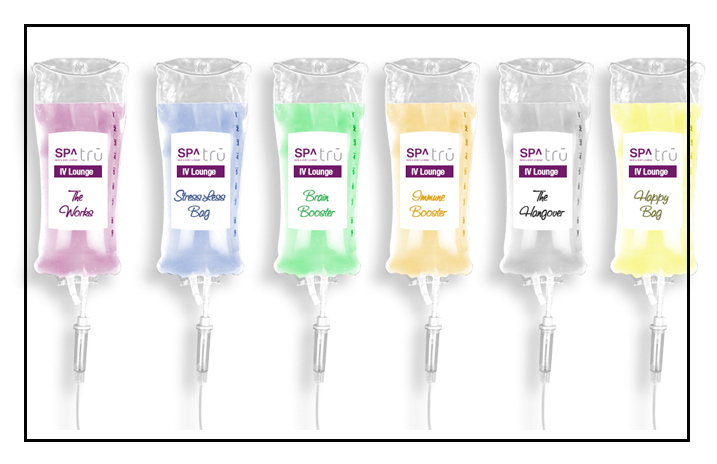 Generally speaking, an IV push uses smaller volumes of nutrients and the treatment is given over a shorter period of time, about 10-20 mins. An example of a well known IV push is the “Meyer’s Cocktail” or our “The Works”. Intramuscular (IM) injections are injections of nutrients directly into the muscle. By injecting into the muscle, the nutrients are slowly absorbed directly into the body. A common example of an IM injection therapy id a ‘B12’ shot. All of the Vitamin IV’s start with the fundamentals – Amino acids, Vit C, B complex and minerals. Stress Less – BCOMPLEX, zinc, amino acids, vitamin C.
Happy Bag – B6, B12, Amino Acids, taurine, tyrosine, glutathione. Brain – Taurine, Carnitine, glutathione, b6 and b12, Amino acids. The Works– A perfect blend of all the fundamentals. Fitness Repair Bag – Amino acids, Zinc, hyaluronic acid, vit c, glycine, lysine, proline. Fitness Prepare – energy boost and B complex.